Conversation intelligence platform for sales: automatically record, transcribe, and analyze 100% of your sales team's calls using AI. "Easy to Use and Accurate Statistics"
the Interface is very easy to request feedback from management. You can create tags at a specific point in a call for management to review which creates an email notification for them to quickly interface with and provide feedback. The only thing i would chage to this point, is the ability to set my own real-time notifications. I know our management team has this but i would like training to see how i can do this on my own. If you are looking for a real-time way to self coach or elicit feedback from management, this is the tool for you. Also provides accurate tracking on conversation behavior. When you have those busy days with back to back prospect/client meetings, it's fantastic to have Gong to review the calls and recall what you may have promised as a follow up. This has helped me many a time. Also, my team and I are enjoying it for training purposes and peer review - something we do consistently with each other to give feedback on our meetings, demos, and closing calls. Gong is still evolving (exciting!) so I find that it doesn't track all the 'points of interests' / topics throughout the conversation YET. It narrowly pinpoints them, but I still find myself searching throughout the conversation for actionable items. I have already noticed a difference, however, in the past few months of using Gong that there have been significant improvements. It truly is a fantastic tool. An investment that pays dividends in the long run. Working in a tech company myself, I highly recommend this intelligent and intuitive tool. It helps to keep everyone on the team absolutely accountable. Accountable to themselves to track notes and action items properly, accountable to their team so we can all learn and grow from and with each other, and accountable to the organization to make sure that we're having the best possible conversations and demos that are creating long term success with and for our clients. I love the transcripts that Gong provides. The ability to easily go back and check what we discussed and next steps are huge in every one of my sales calls. And not having to listen to all of it, but still jumping to parts of it to listen to based on the transcript... game changing in my sales process. Gong is great except for the mobile capabilities. I travel a lot and am on my cell phone. When I need to make a call and have it recorded in gong it doesn't happen unless I schedule it in advance through Zoom. However the customer service has been amazing and reached out to me and says they are working on this for Q4 of this year!! Now I know when and where he meant. "Learning from sales call has never been this easy"
If Gong solely tracked recorded conversations, that would be nice but not necessarily a differentiator from other tools. What I really love about Gong is the statistics on performance. I've worked with my manager to improve my interaction (i.e. how other does the conversation switch between the prospect or me talking) and Gong has helped me measure those improvements. It's also helpful in terms of tracking my talk ratio and making sure I'm not doing all of the talking during a conversation (which can be a very easy yet bad habit to adopt). I wish that accessing and understanding some of the statistics was more intuitive. I had no idea some of the statistics like interaction existed until my manager showed me. One other thing that I don't like, although it's a small issue, is that sometimes conversations don't appear in Gong until hours later. I'm an inside sales rep, so the main problem I'm solving is learning from my own calls as well as my colleagues' calls. Everyone has their own way of selling and it's especially helpful to see how outside sales and Account Executives run their calls and demos, without me having to shadow them in person. "Shopped a lot of vendors and chose Gong"
Gong provides the best insight and intelligence in the business. The blogs and articles they provide from the intelligence they gather are invaluable. The tool is easy to use and does what it's supposed to! Our CSM is the best CSM I've had for any service. There's not much I dislike. I wish I could do live coaching but I am not sure if it's Gong's fault that I can't. We use Salesloft and Gong transcribes the call recording that Salesloft provides. They also record our GoToMeeting demos. It's the highest quality product in their space. We had a bad experience with another vendor which pushed us to Gong, and we are glad because the platform has exceeded expectations. The insights into the calls are wonderful. We are able to search a competitor and hear every time we've discussed them, we are able to juxtapose the team and at a glance see some trends, etc. In addition to wanting to coach our salespeople and my Sales Development Reps on their calls, the goal is to build a library or training material for our future new hires. "Gong is the BEST! " I love the fact that I can do advanced searches based on words used in the calls, or even certain names. This has helped me, immensely, in my overall sales process and development in my career. My job has done a nice job in making this a part of our everyday processes. I take part of my day reviewing calls of my own and the rest on partner calls or colleagues that I work with. I have also gone as far as taking notes on each and every call that I listen to and develop talk tract's around that! Hmmm...I don't really dislike anything. Maybe that other people aren't able to hear our calls? Meaning, I have certain partners that I believe would gain from hearing my calls and they don't have access. The ONLY other thing that I have experienced have been missed calls. I had calls that didn't record and i'm not sure why because it was over the minimum call time. Other than that, nothing but very good things! . Gong is phenomenal for self-enhancement and overall development. I have been able to target specific calls, and effectively upgrade my sales pitch. I have been able to take time to send my own calls to my leads, or request feedback seamlessly. We have meetings with our leaders every week and a part of what we have to do is send calls and have them critique each one. I do not know how I would have gotten this far without a tool like Gong! "Game changing tech for customer facing teams"
I like that the tools seamlessly integrate with my conference call tech - Google Calendar & Zoom. After a call is recorded, an email is sent to me with all action items I promised, making follow up emails a total breeze. All of this functionality is available without even signing into their back end. When you do sign in, there's a full account history of every email and call you've made. This makes handing off accounts in a CS team a breeze. Further, you get analytics and insights on your calls regarding content, action items, words used. They'll give you tips to help increase your effectiveness such as talk less, pause for longer etc. Literally the best piece of software to add to any customer facing teams tech stack. I don't dislike the software, I really struggle to find any quibbles. The only thing I could say is the tools is built primarily for sales teams - but they're not selling it otherwise so I can't complain. Ensure that you take the time to utilise all of their feature set. Their company blog has hundreds of really valuable articles that have improved my skills at selling. It has allowed our team to record calls without effort and make them very searchable. Other tools in the industry require that you listen to the whole call, but you can really easily search for keywords etc. The other big benefit is the coaching tools included in the product around industry best practices. "Gong, a very valuable tool"
I really enjoy how that the majority of my calls are housed in one area and are easily accessible. I think Gong takes it to the next level by catching key words in the recorded call; this allows its users quickly skip to certain parts of the recording. Not often, but occasionally a call here and there won't capture in Gong and I've found that when that happens it can't be recovered. This is not a common occurrence, so it hasn't become an issue, but there may be a day when there's a call I need another listen to that's not available. This is the only reason I my score is 9/10. Looking forward to where the product is going. Keep up the good work. I'm in a CSM role and I've found that it's really effective because my team can listen to the sales calls before it's hand off. Having access to these calls allows my team to be prepared and ready to be a partner and advocate for our new client. Good overall tool for going over your calls. Simple and intuitive. My absolute favorite feature is how it transcribes the calls into a document, almost like a play script, with a table of contents. It is very helpful for going back and augmenting any notes you jotted down during the call. Organizes even long calls into approachable segments. The transcribe function does get fooled rather often. Usually it is simple to utilize context clues to decipher the actual words that were spoken, but not always. Could improve that transcribing AI. Also, the trigger words are more often than not inaccurate - trigger words where Gong says "this is the closing part of the call" or "pricing part of the call". Not a huge deal, but another area they could improve. Good tool to self evaluate your sales calls and improve your verbiage, presence, and objection handling. It has been invaluable for going over my notes after a call to get additional info or augment what I had written down. From a sales enablement perspective, Gong is probably one of the most important tools I use. The ability to record, review calls, and get feedback are key in making me a better Rep. I'll even go back to listen to the end of calls with my clients before a second meeting to make it easier to pick back up right where we left off our last conversation. Not too much to dislike - perhaps some more in depth explanations of the analytics, and why they recommend certain best practices would be fun. I've used competitor's tools before and Gong easily measures up. We're solving a ton. We're recording calls to share with for clients and doing internal coaching. We have a very complex product and our new hires listed to piles of recordings to get up to speed, learn the product and deal with all the different objections we handle. The ability to parse out different types of demos with different types of clients and save in different folders really helps. We're even recording and saving great demos for investors to listen to! "Excellent tool to help with coaching and training"
I like the statistics and coaching, as well as the ability to search. I am able to zone in on certain words and phrases and learn from them to help improve calls going forward. I was made aware that I don't pause for very long after a customer talks, and this is something I can improve upon, and that I would not have had visibility into without this tool. I can use it to improve my own calls, but it is also great to learn from other members of the team by listening in on their calls. Rather than listen to an entire call, I have the ability to really drill in for specific topics, words, etc. to really efficiently use the tool for learning. Easy to navigate, easy to use, full of great features! I cannot really complain about anything in the platform as I find it to be a really excellent interface with good features. I think you will find the topics and coaching very useful. Use this tool not only for onboarding and training others, but to scrutinize your own calls and learn things about what filler words you are using, etc. so you can improve your phone conversations! The organization has been able to help train new employees and to leverage existing conversations to help them learn very quickly. We are able to use the tool for coaching - for ourselves and for our teams. I like that I can jump to different part of my calls to best analyze it. Additionally I can help my team improve each day. The metrics that are provided to evaluate a team on a whole let you quickly identify areas of opportunity to maximize work efficiency. Also the accessibility to have app integration, makes listening to call on the go an ease and not making you stuck to your desk. There are always downside with any product. The state that you cannot record limits your ability to improve. I seen people are turn away from the product for not understand the technology. More availability to individual training session. There are many people that want to dive deeper into the technology and expand it even further. Expanding the ability to more states on recording. This can help a lot more reps at various companies. I am able to learn from previous calls that were either won or lost. Multiple teams members are already putting in place the feedback that they have received from mentors/management. "Where have you been for the last 20 years??" Gong is unreal and there is no way that I will be able to live without it. We can track patterns which help us improve our presentation and offerings. I can provide coaching to reps in an easy way by tagging them in the comments. No more painful hour long coaching sessions which may or may not yield value. I can eliminate wasted time by listening to calls at a faster speed or just skip to the parts I want to listen to. We have set up key words that let us know which part of the presentation the rep is pitching. So if we launch a new function we can test out the pitch and hear feedback easily. If you are in sales management you need this tool. Honestly I don't really have any issues with the product, we definitely need to refine our filters a bit more but that is on us not Gong. Take the time to set up your key words etc. It makes a huge difference . It has increased our close rate by 10%! . "Useful Sales Coaching in a Box." The quality of transcription is high. The ability to break down a call in minutes is huge. We zero-in on areas of coaching with what was actually said, which beats opinion every time. The automatic transcriptions are super-useful. Would like an easier option to share videos wide beyond those that have licenses. Sharing meetings could be made much more seamless-- it's actually over-engineered. Cut and paste links to calls would suffice. Make sure you're using as much as possible. Insights are for those who dig in... The other cool thing is that there are many hidden benefits to having a universal system in place-- including going back to recall what CUSTOMERS said. Consistency. We find that socializing sales calls dramatically improves the level of discourse. Coaching. Actual calls > salesperson recall, every time. Crushing it. Reps need this tool to get better. "Critical Part of Sales Process"
I most like the auto-recording feature, integration with many conferencing solutions, call transcription, and the ability to separate caller voice tracks." I also love the ability to search calls by call and/or Salesforce attributes, search by content, and the ability to set criteria to automatically group certain types of calls. The "Trackers" feature-and its ability to be customized-is also great for identifying many things, such as competitors, pain, objections, and more. The statistics feature is extremely useful for digging into trends on calls. Availability of Salesforce fields for filtering calls has its limits, although it has greatly improved over the last few months. I also wish I had better visibility into knowing exactly how Gong's AI determines its "Topics" feature within our calls. The ability to compare statistics of multiple call categories simultaneously, side-by-side would also be more helpful. The ability to quickly and easily identify, track, and analyze data in calls that might not or cannot be tracked in a traditional CRM. Gong also makes it easy to review calls for coaching and initiate discussions, flagging potential issues/opportunities using trackers and statistics, and it's a great tool for onboarding new reps and honing skills for veterans. The statistics feature is a core piece of our win and loss analysis. "Game changer for the entire team!" It's hard to pick out one benefit that I like best. Gong has been an amazing solution for our company and has made an impact across all departments—sales, CS, product. If I had to choose one thing I like best I would say it is the built-in coaching. Our reps are able to track their talk time and interactivity level throughout their calls. This feature has changed the behavior of our reps and our consultation calls are now conversations vs. presentations. Nothing at this point. We were one of the early adopters of Gong and there were lots of gaps in the beginning—but that's expected for any new product. Their product team is amazing and I'm blown away with the speed at which they push out new features. As a sales manager the ability to know, on demand, what is happening in sales calls is the greatest value to me. A rep can request feedback on an entire call or just one segment and I'm able to listen and provide feedback in the form of timestamped comments. Our reps are improving faster and are more interested in improving their skills because of Gong. "Gong is an excellent sales assistant/coaching tool." I enjoy being able to go back and listen to the calls that I make, as well as being able to review good or bad calls with my manager. It is an excellent coaching opportunity and a great concept.I also like the fact that if I forget a specific detail from a call, I can go back and refresh my memory as to what happened during the conversation in question. There is nothing that I dislike about Gong. Perhaps the fact that not all calls are recorded however we cannot really work around the law dictating which states allow recording vs. those that do not. I don't have any recommendation other than to simply use it, It is a great tool that can be leveraged in sales and anything in which you may need to re-listen to a call that you have made. In my role, I use it almost every day to listen to my own calls or to send them to my manager to listen to & request feedback from them. Making self-improvement in selling my business is probably the biggest problem I see being solved by this. Those who are not the best on the phone can listen to themselves and evaluate what areas need improvement. "Excellent sales tool that allows for self improvement through call review and knowledge sharing. " I use Gong for two different things, both of which the platform excels at: keeping track of customer conversations during long sales cycles and as a tool for self-improvement in my own calls. The first one is self-explanatory, having the capability to go back to any previous customer conversation and easily pull the "highlights" from previous calls - allowing me a level of preparedness I wouldn't have by just relying on my own notes. The second, as a tool for self-improvement, is probably where Gong has provided the biggest value ad towards my own selling capabilities. Being able to go back, review any of my calls and look at areas that could benefit from improvement, has been hugely beneficial in identifying my own weak points. This, paired with the ability to break down and listen to some incredibly successful calls from others in the organization, has made me stronger at selling our companies product. Not much to dislike - maybe the voice to text translation (being able to pull transcripts of your calls).. it never seems to work for me very well. Having a library of all the calls in your organization, organized and broken down with recommendations and stats, is a powerful tool to have for sales self-improvement (specifically for onboarding new employees learning the product and sales cycle). "Helping me master new sales skills"
I love that I can tag my use of sales skills through out my call, this keeps me on top of my practice and allows me to get feedback from my manager to see if i used my new skills in the appropriate way. It also keeps me accountable to use best practices and not go back to old habits. It has also been a great training tool to see how my teammates handle certain objections with prospects from similar industry's. I love to download calls from top performers on the gong app and listen on my commute home. The only thing I dislike is having to have the prospects emails in your event for Gong to pick up the recording. Sometimes I like to make a separate event and put in my teammates email, and Gong won't pick up the recording. The work around is manually scheduling the call or I white out my conference line and put it in the body of the calendar event to the prospect. This has been better then any call recording service I have used. I have had better demos because I can go back and listen to my discovery calls and write down anything I missed and some better questions to bring up on the next meeting. Reinforces sales training's we have so they don't go to waste. "Gong is a game changer for those who take advantage"
I think one of the best parts of Gong is that it gives the chance to listen in on top performers and fellow associates with great records of success to see how they lead the conversation, the questions they ask, the insights they have and how they approach objections. Its an easy to get on calls on rep calls without having to move your schedule around to do so. The conversation analyzer is great as well. Seeing the ratio of talk time and when things were talked about so you don't have to listen through a long call to find what you are looking for. I don't like that the calls disappear after a certain amount of time. It would be great to just have access to the library of calls from inception to current time. Also, I think a huge improvement would be Gong analysis tagging the highest performing/best talk ratios and throwing together a highlight reel or a "check these great calls out" section so we don't have to dig to find the best conversations to learn from. learn the system and tools Gong offers to help hone your skills on the phone. It can help if you put the time in! Gong helps really understand if the conversation is consistent in regard to proper talk time ratios, step process (intro, value prop, questions, next steps) is in effect, and you have the right cadence when talking. It helps you become more self-aware and live in reality rather than an idealized version of yourself. I love how my calls are analyzed and transcribed within minutes of completing the call. I can go back and tag my manager on certain parts of the call if I need him to review a client request. I can also make notes on the call so that if I ever need to refer back to it in the future, it's easy for me to find the key pieces of the convo rather than listening to the whole thing again or reading through the full transcription. Gong has also helped me recap my convo with the client since during the call I want to focus on engaging with the client rather than taking neat and organized notes. I would like to be able to download only snippets from the call instead of download the full call. If you need a better system of taking good notes during calls so that you can properly follow up with clients afterward, this is exactly what you need. Extremely quick call transcription is fantastic. "Trackers" is extremely valuable to identify problems, objections, and to make sure account executive completed the call flow. The ability to snip a section of the call and share it easily is another fantastic feature. I'm not able to use points of interest in the mobile app. Other than that feature there is nothing else to complain about. Gong is a no brainer and well worth the price. Our team couldn't imagine a day without using Gong. The ability to use Gong to coach " in the moment" is a game changer for the sales team. The sales team has improve faster with Gong than the previous system. The time savings alone is worth the money. Having the call transcription read like a screenplay is Awesome! "Gives you the insight you need to succeed." Gong makes tracking sales calls so much easier. From the ability to go back and listen to detailed, analyzed recordings, to having an actual transcript of my conversation that I can search, Gong takes the tedious clerical work out of sales, allowing me to spend more time engaging with customers and seeing which sales techniques are most effective. Also, the app is awesome. I love being able to download my calls and listen to them on the commute home when I'm on the train. I can't wait to see what new features the gong team can come up with. I couldn't find a way to see transcripts on the app. Otherwise, I think the overall experience is fantastic, speaking as a user. I would definitely give it a shot. I wouldn't want to go without it now that we've implemented it. All the sales managers say the same thing: it's great. The amount of time we save now with gong is incredible. It allows me to focus more on having a dialogue with clients, rather than multitasking by writing notes and such. In order to have the same output as before, I would practically need an assistant transcribing all my notes and listening to my calls with me. Now, it makes it so much easier to just focus on my work, making my calls, and knowing that Gong is taking care of everything for me in the background. "BDRs' Dream Sales Enablement Tool "
Requesting feedback from my supervisor on certain parts of my calls is one of the most valuable features for me. At times, I will come across a question I have never been asked by a prospect, and it's extremely helpful to request feedback at that certain point of the call to gain immediate feedback on how to tailor my response. The translation from voice to "script" is incredibly useful for visual learners. However, the translation is imperfect and has opportunity to improve... Perhaps my southern accent has something to do with it as well. Encourage all users of the product to record their calls to heighten its benefits! I enjoy listening to others' calls on the Gong app when I'm getting ready for work, driving, etc. to develop my skills and get different perspectives. We have Gong linked with GoToMeeting, so all calls are recorded. Account Executives within my organization are able to capture their interactions with prospects, and these conversations are used as training for BDRs. Our sales team in its entirety is held accountable for what they discuss with prospects because we are able to go back and listen to recordings at 2x speed to revisit information. "A must have for customer facing roles"
As someone who is not in a sales role but uses Gong, I can confidently say I am a huge advocate for Gong. At first I thought it was a 'nice to have'. After using it for a few months I can say that it is a 'must have'. It's like one of those things that if you never used it your life is ok - but once you start using it you can't stop. The ability to easily record and share meetings with clients is incredible. Gong integrates so seamlessly with all of our tools that I never even have to think about it, or spend any time on it - aside from utilizing it's helpful features. Honestly, nothing - I have never run into any issues, or had to spend any time figuring anything out. My main uses for Gong: Automatically recording my client meetings, reviewing meetings others internally have held with my clients and viewing transcripts of meetings. Also an amazing tool for training, reflection and onboarding new employees. "Amazing tool that I wouldn't want to be without!" I love that Gong is incredibly easy to use and allows me to focus on the content of my meetings instead of worrying about making sure I'm capturing important details in notes. I have Gong setup to auto join my client calls, so the only thing I would say here is that there is a bit of a lag in recording meetings that pop up. It takes time to setup the call get the recording started, so for meetings that are impromptu, often times the first part of those calls are not recorded. Not a huge deal though and can be worked around by manually setting up the call to record, only problem there is that the recorder will still join which then sounds like multiple people have joined the call. You need this! So many benefits and super easy to use. > Great training opportunities to listen to other team member's calls. I have been able to learn about other clients and other team members presentations that I otherwise would not have had access to. This also allows for my manager to listen to my calls and have great coaching opportunities. > Easy to reference client calls to revisit details of the call and next steps. This has made it easier for me to make sure I'm delivering on agreed upon next steps. > The organization and search-ability is great, making it super easy to find calls with a certain topic covered, calls by a certain person, or calls with a specific client. > The ability to share recordings with other internal teams and clients to reference work that we've done is awesome! I have been able to share recordings quickly with clients that they can refer to as needed vs. me having to write up details and take screenshots to recreate things covered on calls = huge time savings. > The ability to speed up the call when listening back has allowed me to maximize my time by listening to lengthy calls in much less time... again = HUGE time savings. "Great software for onboarding, getting feedback and helping me improve as a Sales Rep"
Gong has been really helpful as an Account Executive because it allows me to go back to my calls, skip to the parts that I thought I did really well on and those that I think I could improve on and allows me to see what my colleagues are doing so that we can learn from each other. I particularly like the fact that I can request feedback from my manager at certain points in the call and we typically have a meeting every week where we discuss feedback/improvements. It's also really helpful because the reporting allows me to benchmark my calls with my colleagues and see what they are doing that is working well. The interface is user-friendly and the software automatically joins your calls, so it's super simple to set up! The transcript feature and the analysis of what topics were discussed in what section of the call are not always super accurate but this hasn't been an issue in getting the main value of the platform, which for me is the ability to get feedback from my manager and see what colleagues are doing. "Gong is an absolute Game Changer"
Gong is a true solution. Our sales leadership was able to review and coach more calls in 2 weeks than we had in the previous Quarters. Gong also allows your reps to take their own development into their own hands. Reps are learning from our top performers, on their own time, even on the go with their fully functional mobile application. I am able to get right to the most important aspects of the call within minutes, listen to calls at 1.5-2x speed (allowing me to coach more than ever), identify trends between reps, create libraries for on-boarding. All of this took minimal set-up. We were able to gain enough value during our trial period with nearly 100% adoption by all reps. The application is endless, as our CS and Impsec teams now are leveraging the platform as well. Unlimited non-recorded users allow for company wide adoption. Marketing, Product, Product Marketing, BDRs, Leadership can now listen to all sales calls and demos on demand. Also the ability to revisit calls during Sales Handoffs & in Deal Cycles vs. trying to find a static document with notes...Its incredible. The transcription is a little off, which can be a little funny when reading back over the document. It is also limited to English Language, we do have a multi-national organization, so not all users can get the benefits gong offers. These are minimal challenges, and I had to think hard to find real areas that I dislike. The value outweighs our process before, and it is not even close. Use the free trial and test it out for yourself. This product was sold from the trial experience alone. It makes things that were previously unimaginable, a reality. Coaching, Professional Development, Alignment between BDRs & Account Executive Teams, Alignment between Marketing & Sales, Alignment between Success & Sales Teams, Manual Note Transcription, Competitive Analysis, Data Driven Coaching, On-Boarding, Sales Qualification Methodology, Active Listening vs. worrying about taking notes, sharing best practices. "Great for training and understanding account history"
When I started a new job, Gong was a great resource for listening to my peers' calls. Gong recordings were more efficient than asking to shadow real-time calls. It's also easy to find the parts of calls that are most critical to listen to because of the labels/indicators on who is talking and about what. I work in Customer Success, so I like that this is a way to understand a customer's journey before being transitioned to the CS team. I would recommend new users to take advantage of the training resource because Gong is intuitive to use but there is functionality you could potentially miss by not going through . a guided process in the beggining. I think sometimes the labels about what is being discussed could be even more helpful. For example, identifying and labeling what parts of the conversation are about discussing pricing. Go through the training resources. Gong is intuitive to use without them, but I recognize that I am missing some of the full functionality by learning how to use it myself. The main business problem I see our team solving with Gong is training an on-boarding. Gong helps new team members have access to a wealth of information on their own time, instead of relying on their peers to add them to upcoming calls. I could also see Gong being very useful for reviewing your past customer calls or when transitioning accounts. "Fantastic software to improve sales performance "
I have a poor memory and am not the best multitasker. When I need to recall something from a meeting, I can easily listen to past calls. I also LOVE that the recordings can be sped up so I can find what I am looking for quickly. That feature saves me so much time. Only listening to my own voice. Yikes! That part isn't fun to hear. I do wish I had control over which of my recordings were saved. There are some I would like to delete, but as a user I don't think I have those privileges. As a salesperson, I love using the software. I find that my follow up meetings have been more effective because I can easily understand EVERYTHING that was talked about on the previous meeting. I do also use it to list to my tone, questioning, and prospects responses to learn how to improve my pitch. If you want to help your salespeople sell better, I think this software is a must. I figured I would use it most to improve my pitch, but what found it so helpful to go back and listen to calls to help me prepare for subsequent meetings. "Gong Revolutionizes Sales & CS Coaching"
What don't I like best? I really can't think of much. When I leave comments on the app they seem to come through one at a time via email vs in one big email at the end of a session when I do it on desktop. Could also be user error. Training new hires or existing on new types of conversations. Ability to go back and easily find information from previous calls. Benchmarking successful reps on talk time, questions asked and results. "Innovative Tool with Endless Benefits"
Hard to choose! A few of my favorite functions include the written transcript view, segmentation by keywords, and the separation of audio channels. The transcript allows me to parse through for easier searches, which is incredibly helpful. Keywords show me what filler words I'm overusing to improve my conversations. The separate audio channels automatically show me percentages of how much I'm talking vs. the prospect. Keeping that in mind, I've been able to decrease my percentages from 75-80% to a much more concise 50%. Overall, I love the Gong platform. One function I would find useful would be the ability to have my own individual Library with private folders to organize my calls. I could be wrong, but it seems like I'm only able to create folders in Library shared amongst the company. This tool is so useful! I absolutely recommend if you're looking for a way to improve operationally. As an employee with no previous Sales experience, this tool has been a life-saver. I would not have been able to learn as rapidly or as efficiently as I have without the ability to review & improve my calls. In addition, the tool is so user-friendly & intuitive, it's truly an impressive experience to utilize. The interaction insights. I had been cutting people off in the way of agreeing while they were speaking, and Gong showed me to work on my patience. It has been invaluable in aiding to the confidence in my calls and shortening my sales cycle. Always nice to see where to stop going on tangents and let others speak! Not really anything. The only issue I can even think of is that I don't really need the Heads Up emails in the morning letting me know what calls are set for the day. It's just extra emails to delete. Confidence and consistency within the sales team. Seeing who needs to work on what and who to ask for pointers when they're exceeding the standard in the analytics. Thanks for the feedback and the kind words! Just wanted to let you know that you can turn off the daily email via your notification preferences available in the Gong application. "Gong made on boarding much easier!" Being able to listen to successful reps and the verbiage they are using. Also, transcription calls make it easy to search through and find exactly what I am looking for. The statistics also helped me improve my talk track and overall call structure. Speeding up calls allowed me to listen to way more calls in a shorter period of time. Training and onboarding. Also ongoing critiques like demo reviews. another plus is being able to go back and find the next steps or action items that I need to follow up on. I like being able to refer back to calls. Sometimes I forgot what the client said and to avoid looking silly by calling back to ask, I can just pull the call. Additionally, I like being able to listen to other sales calls and get fresh ideas of techniques or scripts they are using. Honestly, nothing right now. It's very simple to use. I wouldn't say I "dislike" this, but it would be nice if calls loaded sooner. Hardly a big deal. Easily one of the coolest softwares I have seen. A lot of sales reps dont like listening to themselves on the phone but this is a great tool to help you identify if you are talking too much, asking enough questions and qualifying. Awesome! I love how it breaks down your call for you, it shows you how long you spend on a certain topic and lots of other helpful information. I love how I can listen to my other teammates calls so I can improve my own based off what I hear in their call. I think if you need help getting better at how you approach your calls, this is the system for you! I have gained so much from using Gong, all the data it gives you is very helpful and shows you where you can improve to get better results out of your calls. I am improving on my calls and launching out more partners every week. I have found that I benefit from listening to other teammates calls, they help me improve by hearing how they approach different topics. There is nothing better than being able to train yourself without having to ask people how they run their calls, I can just listen to them on my own time. "Great application for a Sales Trainer in SaaS"
I love being able to review the account executives calls with searchable words, reps, features described and promo drops. It makes my job so much easier! I wish I were able to create a library of calls that only I can see. The library feature is global, which too is an amazing feature! I wish I could search for multiple words in a call to find all that match the search. 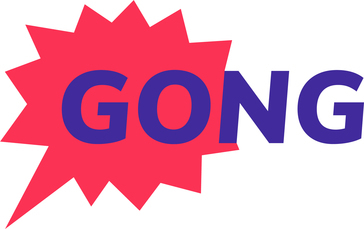 Impact your sales team and sign up with Gong! We want consistency in our sales org. We want to make sure correct information is being given to the merchants. We want to make sure sales process is being followed. As a result of our call reviews, we can solidly enforce sales process. And it is impacting our closed won deals! "Gong has transformed the way we coach and develop sales professionals. " Gong has increased the volume and quality of our call review process. By providing the team with a tool that promotes more self and peer review, we've seen the volume of reviews increase by more than 10x. By helping us build a better library of best in class examples, we have also helped the team really get better by always having those examples they can listen to. The platform is a bit messy. We have more than one group using the tool and unfortunately we can't separate the instances for a clean view from one group to the next. The AI feature in Gong is really valuable. We're just starting to get the data and recommendations and they're incredible. Close rate has increased by more than 4%. New reps are onboarding and getting up to target faster. Development has become fun and a priority which we believe will help with retention. "Highly Recommend - great for busy front line managers"
Gong has aided our organizations in more ways than I originally anticipated. My AEs use it regularly and efficiently to prep for calls, catch me up on issues or next steps for high priority deals that I could not attend, and track their quality through talk time and engagement tracking. Executives at are organization have contacted me post purchase and said "Gong has become a force multiplier for our organization - I'm so glad we've invested in this technology." Honestly I can't think of much I dislike. I think at first I was disappointed that the transcription wasn't great but after using it for a few months I realized that's definitely not where the value lies so I'm very ok with it's lack of accuracy. "How you talk is how you sell!" The stats. When you have enough data on the length of monologue and the mapping of your closed/won deals to the recordings - you have a treasure trove of data to look into and make impactful changes in your org. I am lately liking the blog posts that Gong shares which allows me to guide my team better when I know industry standards. 1. Cannot export data at the level I am interested in. A lot of user level granular data at the moment can only be shared by my CSM. 2. Cannot rename a recorded call. I think that is pretty basic a need. Ryan from Gong tells me this feature will be available in a week. Hoping it does. If you are in the Growth phase, now is the best time to invest when you have lot of data incoming. More data = more insights. So the sooner the better. Gong analyzed over a million sales calls and they sure have a better chance of looking at patterns and providing some great insights. Peer coaching. Plus most importantly my users can see for themselves what is that the best performing rep is doing while engaging the customer and relatively grade themselves for real. I myself hop on to a lot of calls to help understand the kind of customer requirements we come across as one of the top players in the CPaaS space and gauge the general sentiment about Plivo as a provider. Lately some of my other teams are interested in some particular 'word utterances' and Gong makes it rather easy to track those and push them as a mail notification. Rajesh! Thanks for bringing the need to rename a recorded call to our attention! That is now available as a feature. What I like the most about Gong is that I can search for key words in different calls. This is really helpful when I'm trying to fine tune a certain part of my process. I do not like how long it takes to transcribe and process the calls. I never remember which call I just had that I want to send my boss so that I can get feedback. Transcribe the calls quicker and leave out calls that are less than 2 minutes long. Those are typically useless calls to have clutter the system, as nobody is going to listen to them. By listening to myself, I am able to hear where it is that I need improvement. By listening to others, I am able to compare their processes to mine and potentially rework my verbiage to be more successful. "Put that pen down & focus on the call!" Great search functionality for things like "follow up" and other key phrases that apply to our product. It's all color coded (which was a fantastic addition) and extremely easy to use. It's a bit difficult to get gong onto the call for a last minute call, which is something I've had happen a couple of times. The recording loads in fine with enough notice, but sometimes clients grab me at the very last minute. My client calls have 100% of my focus. I'm not worried about missing out on an important detail or follow up item, because I'll be able to go back and double check on the gong platform. I like how it enables me to cut the learning curve. I can listen to calls from the top sellers in my company & I can take what I like from their calls to implement on my own. Ultimately it saves time. The mobile application is lackluster. Gong would be great if it was more enabled on the application but it is what it is. Have a podcast where you bring on top sales execs &/or include calls from other companies that resulted in huge sales & break them down. I'm solving selling problems. I can effectively and efficiently perfect my craft by listenting to other top performers in my company. I'm a big believer in "hacking" & Gong enables me to do so. "Gong helps with with Self-reflection"
Do you ever feel like a call has gone super well and get off wondering how you could replicate that? Or have you had the worst call of your life and would love to avoid that feeling ever again? Well, gong allows you to go back, listen, learn, dissect, reflect and grow as a human and a salesperson. There isn't much that I disliked about the software. I think it made a lot of sense and has a ton of bonus features I enjoy like a heads up for upcoming calls. For the call summary with action items, I guess I would love it if that was 100% accurate but I understand there are technological and linguistic limitations. Do you want insight into your team and what helps them win? Buy gong! Do you want to learn where you can teach your reps to succeed? Buy gong! And do you want to know which rep falls into each bucket? You guessed it, Buy gong! Realized how to improve myself as a salesman. I have been able to identify patterns and figure out where and how I am losing and/or winning deals. It has also enabled collaboration across our team in a very targeted and productive way. We have also been able to solve the issue of note-taking during the call. The gong app is our very own personal assistant diligently taking notes throughout our calls so that we can focus on what really matters in the moment. "Take your sales conversation to the next level"
I have been using Gong for the last 6 months, and this has transformed the way I run my sales call and follow up with my prospects. Gong integrates with Zoom (for our conferencing) and Aircall (for our calling), and now with our Gmail, so that 100% of our sales conversation are captured! I have now the habit of reviewing all my calls, good and bad, sharing them with the rest of my team for feedback, and capturing bits for our library of calls. While it's not always easy to go and listen to your calls ("I hate my voice on recordings! ), it has really taken my performance one step further. The automatic detection of topics (depending on our script and talking points that we had setup in the system) makes it very easy to navigate in calls. The transcript is reliable as well, and helped me several times get all my action items together. Gong also has actionable insights on talk ratio, patience, filler words which also help you improve your calls.. Finally, looking at the metrics at the team level has helped us put together best practices and look at our efficiency, and not just at our absolute performance. There are a few UX quirks that require some getting used too, and the team at Gong has always been very receptive to our feedback. Go one step at a time. The product is very powerful but needs time to master. Better visibility into our Sales conversations. Training of all reps, new and experienced! "Gong throughout ADP's inside sales Experience "
I like that you are able to search specific terminology throughout a call. That way, you can go back, and see if you hit all necessary topics on that call, but better yet specific words or explanations that you DID not say, you can do on the next call. I honestly have nothing that I do not particularly like. Definitely learn all the features so that they can be readily used! In the sales industry, every call can run differently. Being able to look back, easily rewind or fast forward to show others how your call has gone, and even better, listen to other representatives calls. It's helpful to see what you personally need assistance or help on. It's all a learning experience. "Easy to use and Navigate"
Being able to see who is talking, and what each person is talking about makes it easy to navigate the important parts of calls. If your looking for a call coaching tool this is it. It is also a great way for you to go back into a call and see what was said and highlight things that went well or poorly. I use it even on the SDR side of things in order to get a better understanding of what I need to say when attempting to get other folks from that organization on a demo. I would highly recommend the tool and I use it daily. It integrates with a variety of technologies as well which allows a variety of users to use it. "Gong is an incredible Sales tool!" Gong helps me sell better for the following reasons. 1. It allows me to be extremely present on calls. I'm able to conduct authentic discovery and really speak to the needs of customers versus being distracted by taking notes. 2. I'm able to tailor future conversations. I love going back and listening to calls to make sure I'm nailing my next presentation. I look like a rockstar when I'm able to use my prospect words back to them. I'm also able to confidently present information because I know it's founded in truth. 3. I love gamifying it for myself. Based on the metrics that gong gives me I've been able to improve my patience, balance out the amount of time my prospect is talking versus when i'm talking, and make sure that i'm having enough interactivity on my calls. 4. I love sending over key parts of the conversation to my prospect as a follow up. It's also helpful for my champion to share with their leadership to help close the deal. Honestly - nothing! It's so robust. It gives me features that I didn't know I needed and now I can't live without them! Take time to dig into the more advanced features like "beat". There's tons of valuable data in the solution that will help you improve your sales process. Gong has made me a better salesperson. My management uses the calls to coach me. I love how easy it is to review my own calls by topic. It's the most important tool for my selling process. I love that Gong pulls together our dial calls through Salesloft and video calls from Zoom into a clean interface where we can collaborate and coach each other as a team. There really is not anything that comes to mind that I do not like, BUT, one feature that would be nice (assuming I am not missing it) would be the ability to rename a video upload once uploaded. There are instances where I have a meeting that reschedules and I do not update my calendar and thus not syncing Gong where I need to upload a video. I have had to delete and re-upload because the video name follows the name of the file and cannot be edited from what I can tell. The software is intuitive, and setup so that collaboration with other team members and even external trainers/collaborators is seamless. Just wanted to let you know that as of March 2018, you can edit the call title for any call (uploaded or recorded). Hope this helps! The ease of recording...the integration with Zoom means all calls with clients/prospects are automatically recorded with no extra effort. I've never had to look up how to use the product, it's all very user friendly and simple. Transcription isn't that great, but I don't use it much so it doesn't bother me. Can't add much more because I really like the product for what I use it for. Perhaps we aren't making the most of all features provided? If you need full call transcripts this isn't the best tool, but otherwise it's perfect. More transparency about calls and meetings, ability to focus during a meeting instead of hastily taking notes. You can always go back and listen and remind yourself of action points afterwards. The ability to see how was speaking and for how much of the call also helps you analyse your own behaviour and improve. The topics of the call are automatically added which is great as well. * We monitor all Gong reviews to prevent fraudulent reviews and keep review quality high. We do not post reviews by company employees or direct competitors. Validated reviews require the user to submit a screenshot of the product containing their user ID, in order to verify a user is an actual user of the product. Hi there! Are you looking to implement a solution like Gong?